To remind you, we bought Khajaaly in early Summer, and had high hopes for him. Alas, in his first three runs he seemed to be alarmingly regressive. Hindsight, being the wonderful thing that it is, clearly shows that poor old Khajaaly was feeling the effects of a hard season having had six races this year prior to our acquisition. Three subsequent runs made nine in total and one knackered beastie. Step forward Julia 'The Judge' Feilden. Training horses is a game I will never know more than scraps about, and I am always happy to leave my affairs in the hands of people better qualified than me. So, when Julia suggested some time off, I immediately agreed. Firstly, as I say, she knows infinitely more than me about the nuances and foibles of nags, and secondly, to be frank, I was at my wit's end in terms of what the hell to do with him! Seventy-three days later and Khajaaly was ready to roll again. Julia, John and the team were all making positive noises about how he was looking, much fresher apparently. They said he was working well and, when I spoke to Julia on Friday morning, she said something she very rarely says. Julia said to me, "I think he'll win today". In all the time I've known her (ten years), I can remember her saying that maybe four times. Once was when Spruce was backed off the boards (16's into 5/2) on UK debut and was beaten a fast diminishing head, prior to running up a sequence of four straight wins. Once was when Love's Design won a seller by FIVE lengths, and once was last Friday. I told the members and backed him accordingly. All morning he'd been 10/1 and 12/1 with the bookies so I thought 18/1 on Betfair was great value. When he went 28/1 on Betfair I went in again. When he went out to 46 (!!) on Betfair I couldn't justify any further depth to my wager, so I let it ride. He opened up 33/1 on course, before some of the Geegeez Racing Club members punted him into 25/1. To render an even longer story ever so slightly shorter, he cruised through the race and - though only winning by an official margin of half a length - he bolted up. The jockey had no need to resort to more than hand urging. When I spoke to Julia afterwards, using what very little remained of my voice, I must have sounded like Barry White with laryngitis. I was hoarse from yelling at our horse! Anyway, Julia told me that Khajaaly had been working as well as Spirit of Sharjah, another horse in her yard, rated 97. Given that Khajaaly was rated 60, I wondered if this meant Spirit was no good or Khajaaly was flying. As luck would have it, I was able to find out on Saturday, when Spirit of Sharjah ran in a very competitive Class 2 handicap at Lingfield. He had an ugly 'car park' draw in 13 of the 14 runners, and I had a very small bet just out of interest. He cruised through the race in the same way that Khajaaly had done around 24 hours earlier and, although only winning by a short head, he too was value for more as the jockey only got serious in the last 100 yards after Spirit had trouble getting a clear run. He returned 10/1. As if that wasn't enough, Julia had one more - extremely unlikely - ace up her sleeve. Rated just 48 on the flat, and having her third run over hurdles, Baggsy had recorded eighth and tenth places in her previous two attempts at distance and obstacles. But one thing this daughter of Statue of Liberty adores is soft ground. She'd run by far her best recent race on the soft at Yarmouth and it had come up soft again at a notoriously testing track, Towcester. This was a selling hurdle, and to call it moderate is to overstate the quality of beast on display. Baggsy opened up 40/1 and was backed into 28's at the off. I had two quid win and place, much more in token hope than any kind of expectation. As the race progressed, Mattie Bachelor kept her out the back. For the first mile, it was hard to tell whether this was the jockey's choice or a necessity for the horse! But they went off too quickly for the grade and ground, and they came back. Oh boy, did they come back. Baggsy never threatened to win until the last furlong but she still had five in front of her. Five yards from the line, she was still second, four yards from the line, she had prevailed. Amazing, and hope now springs eternal that in bad ground juvenile selling hurdles, perhaps over slightly further than two miles, Baggsy might actually win again! Undoubtedly it was a red letter weekend for Julia, John and the team at Harraton Stables and, whilst I managed to back all three - to wildly disparate stakes - the 8,007/1 treble alluded me (and, I'm guessing, every other punter in the country)! On a completely separate subject, my sincere thanks go out to all of the 36 people who applied for my 'apprentice' position. In actual fact, it's more of a 'right hand man' role than an apprentice. Wrong! It's fair to say that around two-thirds of the applicants would have been able to help me, and picking amongst them was tough and required an objective head. Eventually, I managed to whittle down to five super candidates: three currently run websites that you may very well frequent; one ran a football forum for five years; and the fifth was a senior IT manager before a recent lifestyle / career change freed up much of his time. I spoke with all five yesterday, and that did little to make my task easier! Today, I'm ruminating and will be in touch with the quintet tomorrow. It's been really inspiring to learn that so many people want to be involved in a more hands on capacity in the Geegeez community and, without sounding like too much of a 'happy clapper', I'm humbled yet again by what a fantastic mob you are. THANK YOU! I'll be back later in the week with an ante-post view on the Gold Cup. Without spoiling the surprise too much, I'll say this. The last horse older than ten to win the Gold Cup was... What A Myth in 1969.Ten year olds do okay, but you have to go back to the Cool's, Dawn and Ground in the nineties to find the last winning horse with a double digit age. Given that Denman and Kauto Star are both to be eleven on January 1st, and that Imperial Commander (currently sidelined with a minor injury) will be ten, and that the fourth favourite, Big Buck's is an odds on shot for the World Hurdle (and can't jump fences anyway), I make the race absolutely wide open! Whether I can find the winner is a moot point for sure, but taking out the first four in the betting will certainly assist in the quest for value!! Firstly, a quick gloat about the big race on Saturday, the Scottish Grand National. My choices were highlighted here earlier in the week for all to see (and aligned remarkably with a number of other sources of online goodness, notably Gavin's Festival Trends). Thirty runners and four miles of racing later, Merigo stayed on well to repel all challengers, principally last year's runner up, Gone To Lunch. In so doing, they managed a 1-2 for my trio against the field (the other, Auroras Encore, ignominiously parting company with the jock at the very first fence). 18/1 was the price of the winner; or 24/1 on the tote; or 26.71/1 Betfair SP. For those adventurous enough to play the forecast (that certainly wasn't me! ), the exacta paid Â£207.70. Nice. OK, gloat over. Onwards and downwards! Now then, unless you've not signed up to a single email list in your life (and if you're reading this, it probably means you have), you will have received one or more mail notes regarding a certain James Fitzmaurice, who runs the website at bettingsystemtruths.com. Whilst I don't know James personally, I have followed his progress online (as I do with many others), and I've been impressed with the niche he's carved for himself. As far as I can tell, James started out with some questionable ideas a few years back, but has since had a sort of online epiphany and become a straight talker, and someone who tries to steer systems buyers towards the good products. Clearly, in so doing, he will upset some product owners. That's the nature of his approach. However, the email that was sent out - upon which I've no desire to dwell - had at best tenuous and circumstantial evidence within it, and at worst libelous acerbic invention. It's not my job to defend James (he's big enough to do that for himself), but it could just have easily have been me that was the subject of such an attack (and indeed I don't rule out the possibility of that happening despite my stainless reputation, such is the seemingly arbitrary nature of these emails). Anyway, my point is that in my opinion James is a decent bloke trying to do right, and I was surprised and disappointed at the lengths that this anonymous (naturally) spammer had gone to. Changing the tone completely, I've got a new poll up where I'm trying to learn something about you wonderful people, as a whole. It's a demographic question, oh yes. Anyway, it's also optional so if you don't want to share, then don't. If you don't mind though, it helps me understand to whom I'm writing. (And, of course, helps to better write to you and for you). Next up, it's the Punchestown Festival this week: a five day puntathon that will test the mettle (as well as the wallet and the liver) of even the hardiest wagerers. I did some research for the Irish Field around favourite performance, and came up with some interesting findings, depending on whether the horses had run at Cheltenham's Festival or not. 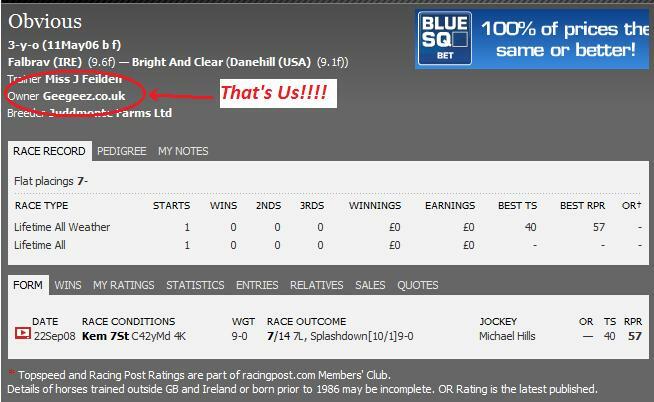 You can find those finding on my horse-racing.ie site here: Punchestown Festival 2010 Pointers. Good luck if you're going to Punchestown, or simply punting on it. You'll note that this is a shortish post today, despite the breadth of subject matter. The reason for this is of course the big live events this Thursday and Friday, on London's Pall Mall. I'll be hosting two days of instruction, with fun and sandwiches to boot. I finished my presentation materials yesterday, and now I'm really excited about the events themselves, which will be the springboard for twenty or so new players in the market over the course of the next year. You're sure to hear about many of them here in coming months. It does however mean I will be heavily distracted this week, so if you don't get a reply to your email in the normal time frame, please bear with me. And if there isn't much going on here on the blog this week, please bear with me. I've promised to give my undivided attention to my Platinum group, and that is exactly what I am committed to doing. Normal service will resume here in a week or so's time. Thanks for bearing with me between now and then. Also this week, the Geegeez geegees return to the track! Tomorrow, Always De One has an engagement in the 4.45 at Wolverhampton and, whilst she's almost top weight in what (according to the handicap range at least) is a moderate contest, she might struggle against some unexposed types. There are four runners (from a field of thirteen) who have had the obligatory three maiden starts to get a handicap rating. Often these horses leave their previous level of form behind when they hit handicap company. The one that might be 'darkest' is Lucky Traveller, who was outpaced in his three starts... over five and six furlongs. He now races over a mile and quarter! Hmmm... He might be just a poor horse, or he could improve considerably for the extra half a mile! Time will tell. That said, on known form in the book, Always has a decent chance. She's second best on speed figures, sixth best on Racing Post Ratings, and third best on official ratings. The application of cheek pieces will hopefully keep her focused, as she can run a little lazily in spots, and she's well enough drawn. I'll be backing her each way and hoping for a bold show. Later in the week, on Saturday to be precise, Baggsy is entered in a fillies' race at the same venue. She's towards the bottom of the ratings bracket for the race, so may or may not get a run. We can forget her last race (as she was in season), and she'll be ready to give a good account of herself. I've yet to see the entries so can't say whether she might trouble the judge at this stage. Finally, Night Orbit is now in fast work. He'll have a run or two on the flat when the ground eases, and then we'll plan a summer novice chasing campaign with him. As a 124 rated hurdler, he'd have a chance of winning one or two little races before the big boys come out to play in October/ November. Early days but a lot to look forward to there. Finally, did you get hold of David Peat's free systems compendium yet? If so, I hope you liked it. If not, you can grab it from the link below. You can also sign up for his bang in form Horse Profiles services which, as I explained on Friday, is excellent value at around Â£8 a month (Â£57 one time payment). LEAVE A COMMENT! I love 'em! It's been almost a week since last I posted, dear reader, and there have been many horsey happenings in the interim. Today's post will bring you up to speed with that, as well as - for those who might be interested - my geographical whereabouts. Firstly, cast your mind back to last Friday / Saturday and the heat and pomp of Santa Anita, where the Breeders Cup was once again demonstrating its prevalence as an end of season flat festival. It doesn't always attract the best animals from around the world, but there were many worthy champions over the two days, including Midday, Goldikova and Zenyatta. Funnily enough, all three of those are fillies. The first named was a game winner for 'Sir' Henry Cecil; the second was a brilliant repeater for Freddie Head and Olivier Peslier; and the last named was an ultra-impressive winner of a sub-standard (in my opinion) Classic. But my, how she flew! - Avoid A P O'Brien at the Breeders Cup. He doesn't use Lasix like pretty much every other trainer does (this drug seems to give horses a performance boost when used and, whatever your stance on the use of medication in racing, from a pure punting perspective, it's like conceding five lengths from the gate). And he's had just four winners from over sixty runners in recents years, making him extremely expensive to follow. Having not backed Man of Iron, but bet pretty much all the rest, I can tell you I'll be avoiding him next year. - Avoid Johnny Murtagh. If you watch re-runs of the races, you'll see he tried to take every single horse up the inside rail. He always does. Watch the Yanks, and you'll see they win from all over the track. Murtagh is a top jock on British and Irish tracks, but he's totally one dimensional in the States, and they know it: they box him, worry his horses, and generally mess his chance up. He needs to help himself by watching a bit of American racing! - Stick to these races if you want to back the Euros: Marathon (Yanks don't stay that far! ); Turf, Mile, Filly and Mare Turf, Juvenile Turf, Juvenile Fillies Turf (we won't win all of these races, but the Euros are much better turf horses generally); Juvenile (despite being on the synthetic surface, our two year olds have more experience and stay better than the Yanks - this race also finds upset winners like Vale of York and Wilko in recent years). Closer to home, and typical enough as I'm now out of the country, two of the Geegeez interest beasties ran this week. Firstly, on Sunday at Market Rasen, Night Orbit was bidding to concede seven pounds in a novice hurdle, and beat off all bar 28/1 shot The Giant Bolster. That one had run two nice races prior to Sunday, and it wasn't the biggest surprise that he won. Disappointing though, and summed up my punting weekend. Orbit will now be stepped up in trip again to somewhere between 2m6f and 3m, and we'll hope to outstay the rest (the Bolster had too much speed at the end of the race for our boy, who now has one win and FOUR runner up spots from his five hurdles runs). The form looks solid enough though, meaning we have a nice hurdler to look forward to, I think. Then last night, Geegeez Racing Club members watched our Baggsy run her second gallant race. Those of us who were at Newmarket a couple of weeks ago knew she was working well - she took Night Orbit and Obvious down (albeit at a favoured trip against Orbit and a significant fitness edge on Obvious) - and she continues to please in decent maidens at Kempton. Baggsy now needs one more run to get handicapped, and that will hopefully come in the next couple of weeks. It will be most interesting to see what the handicapper makes of our young'un, as she's very well related to winning all weather horses. There are still a couple of shares left but a number of them have been snapped up in the last few weeks (I haven't had a chance to update the Club page figure), so if you might be interested in following Baggsy's progress between now and next July as a part-owner and contributing to a charitable cause as well, check out the Club page. Lastly on the geegees front, a quick update on the 'chase outsiders' system I gave away about three weeks back. As I had mentioned, the strike rate is low (around 10%), but as a fun system it's hard to crab. After finding the big 33/1 winner at Ascot at the end of October, it has also picked out 16/1 Kelso winner Justwhateverulike (paid 23 for Betfair SP), and 6/1 Carlisle winner Treehouse (paid 8.83 Betfair SP). The system is good until the end of November, and definitely worth a check. (to save it locally, right click the link above and select 'Save as' or 'Save target as'). Now then, I've been drowning my punting sorrows in a bit of a travelfest Stateside. So far, I've had three internal domestic flights, and the last of them actually brought my bag along too! (Yes folks, I've already had two lost baggage claims...). My trip to date saw me spend three days in San Diego, doing a reconnaisance as this is where I'll be based for five weeks from the end of November. Then it was up to Pasadena for the Breeders Cup (three days there); then Venice Beach for three days; and now I'm in cool but sunny San Francisco until tomorrow. Thereafter I'll be headed to Napa Valley for some wine-glugging with the missus; then Yosemite National Park; then we'll be road tripping down the Pacific Coast Highway, before arriving in San Diego on 25th November, just prior to Thanksgiving on 26th (a B-I-G deal over here!). Finally, some Thursday fun. Seeing as I'm in US, how about that awesome car chase from The French Connection (even though that was based in New York, some 2,500 miles away, the cab drivers here drive like this!)? Geegeez Racing Club II – Say Hello To Baggsy! I was overwhelmed these last few weeks, dear reader, by both the speed at which the shares sold out and the number of people who were interested in our inaugural Geegeez Racing Club horse, Obvious. And so, it would appear, was Julia Feilden, our wonder horse's trainer. So much so in fact that she asked me if there were any more readers interested in getting involved in club ownership. I'm hopeful this will appeal to some of those who couldn't present all of the funds at the time, or might have been away and missed the opportunity. Julia has two lovely horses in her yard called Bushy Dell and State General. If you click their names, you can see their race records. They are both winners. And they both have the same dam (mum), a mare called Nisibis. In fact, Bushy Dell has so far won three of her thirteen all weather races, and been second on another two occasions. The General has been first or second on three of his five all weather runs. Well, Julia has a third horse from the same mum, and with the same dad as State General. The horse has been named in homage to the late, great greyhound trainer, Gary Baggs, and is called Baggsy. Baggsy is a two year old, who has yet to run, and he is currently in 'fast work', which means he's very close (about two weeks) to his first racecourse outing. The plan for Baggsy was always to sell 100 shares at Â£250 each. Julia tells me there are just 34 shares left. So what does your contribution get you?Â Well, Baggsy is a different setup to Obvious, in that half of all prize money and half of the sales price will go to cancer charities. So, if you're expecting to make big money from your Baggsy share, you're probably barking up the wrong horse (as it were). - Nothing else to pay ever - the horse will run between now and next July, when he will either be sold, or members will be ballotted on whether to keep him in training for another year. (NOTE: There is NO obligation to remain involved beyond the first year). - Racecourse badges on a rotation basis (i.e. if you didn't get badges first time, you're more likely to get them next time and so on). At most tracks, we can get discounted badges where necessary for additional members who wish to attend. - The thrill of racehorse ownership, at a working man's price (imagine telling your mates down the pub that 'your' horse is running today / tomorrow / next week, and it's fancied / will need the run / has a good each way squeak). - The chance to meet me (no, I won't be taking one of the badges!) at the track. I'm not exactly sure whether this is a benefit or not, but I'll be there nevertheless! Both his sibling horses seem better suited to the all weather surfaces, so it should be no major puzzle to work out where Julia will be pitching Baggsy in due course. Once he's qualified for handicaps, he'll be placed to be competitive, and we'll be hoping to recoup some / all of our investment via the betting ring / exchanges. IMPORTANT NOTE: Please be sure to let me know if you've done this, so that I can tally the account with your investment. 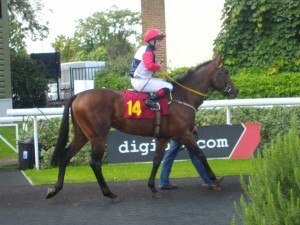 It promises to be a lot of fun and, should Baggsy run well on debut, his share price will almost certainly rise. (Obviously, that's only fair to those who got involved at the outset). Maybe see you at the track soon! https://www.geegeez.co.uk/wp-content/uploads/2018/09/geegeez_banner_new_300x100.png 0 0 Matt Bisogno https://www.geegeez.co.uk/wp-content/uploads/2018/09/geegeez_banner_new_300x100.png Matt Bisogno2009-07-24 08:51:312009-07-24 09:34:09Geegeez Racing Club II - Say Hello To Baggsy!